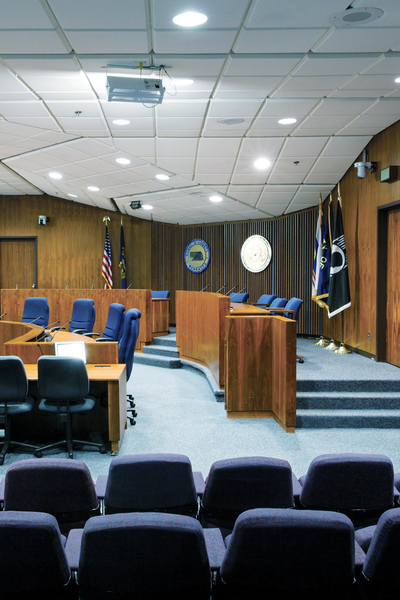 The goal of Government Noise Control and noise reduction in courtroom layout and design is to reduce reverberation ( echoes ), which will then increase speech intelligibility . The standard layout and design of these courtrooms usually include hard surfaces for walls, floors and ceilings causing excessive sound reverberation (echo) within the rooms. 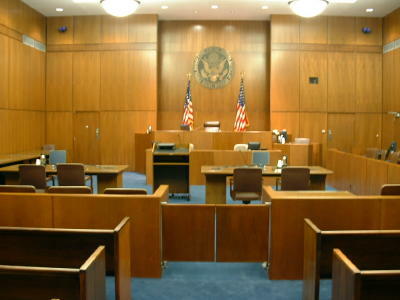 A good courtroom design and layout should include sound absorbing materials to reduce the reverberation (echo) in the room while maintaining an aesthetically pleasing appearance within the courtroom. Reduce the background noise by absorbing the unwanted sound reflections in the room through the use of a series of soundproofing wall or ceiling mounted sound panels or ceiling tiles. As the sound waves spread throughout the room, the panels will capture and convert the sound energy. With wall or ceiling mounted sound panels absorbing the unwanted reverberation within the room, background noise drops while speech clarity improves in a court room setting. One example of Government Noise Control is, Mr. Oswald of NASA reached out to All Noise Control for help in replacing deteriorated foam panels in a test cell used at NASA. The test cells used at NASA are exposed to all types of equipment, engines and combustibles during testing. They required a quality foam panel with high fire ratings. All Noise Control knew that their Class 1 Fire Rated Melamine Foam Panels was ideal for such potentially volitale test environments in addition to being resistant to most organic solvents, alkalis, and diluted acids. The ANC Melamine Foam Panel, when exposed to high heats and open flame, will simply melt without creating smoke. This offers a much safer and controlled foam test cell. At one of Boeing’s Arizona facilities they had an on-going sound problem between work areas and once areas. These types of problems typically effect the tangent once areas in multiple ways including loss of productivity and danger of constant sound levels. Boeing’s Network Infrastructure department had a noise problem. The electrical testing being done in this department caused disruptive noise levels start working in and around the testing cubicles. The overall room height was 12’ while the cubicle’s only reached 7’. The open top allowed the noise to carry throughout test room. ANC suggested he hung the AB1 from the ceiling to connect to the top of the cubicles to deaden the sound between areas. At one of Boeing’s Arizona facilities they had an on-going sound problem between work areas and once areas. These types of problems typically effect the tangent once areas in multiple ways including loss of productivity and danger of constant sound levels. All Noise Control was contacted to solve this problem. After discussing and reviewing the sound issues, All Noise Control clearly saw this as a sound transmission control problem. Sound needed to be kept from transmitting from the work areas into neighboring once space. While absorbents would help in dealing with the sound levels, the problem was specifically preventing the noise from interrupting the office work environment. All Noise Control’s AB-1, acoustic Blanket and Curtain systems were perfect it for such a partion. The Acoustic Blankets, AB-1, boasting ranges of 15 to 20+ decibel level drops. These sturdy blankets can be suspended easily allowing them to t into any existing environment from hardware or existing structures with grommets or acoustic blanket & curtain hardware.